I was entrusted with a small library of books a few years back. I had planned to incorporate them into a chapel library, but that dream never came into fruition. Days turned to weeks, months and then years as these books became forgotten in a corner of my personal library. Upon moving to a different city, I rediscovered these books and resolved to either read them or give them away. I have given a lot of these books away. 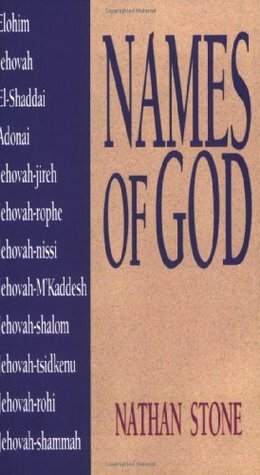 The Names of God is a book that I have heard a lot of people reference over the years, so I decided to give it a read. This is a simple, straightforward read. It is quite informative and leads into worship quite nicely. My only critique is that, like a lot of books of the genre, it is very formulaic and tries to present the revelations of the names of God in a dispensational model. That's fine when it naturally fits, but at times it seemed forced. It suffices to say that God reveals himself to his people appropriately, rather than implying that God progressively reveals himself according to some over arching meta-narrative. Note: this is not the order which the author presents this material. These are my own observations. I give this book 3.5 of 5 stars for readability and content. If you can get your hands on this book, please read it. It should enhance your understanding of certain passages of scripture. I will not look at a passage with LORD versus God or Lord the same way again. It really helps to have some knowledge of the meaning behind these names of God.